Are you struggling to pick out the food that you’re going to serve during an upcoming party? When you work with an experienced caterer, they should be able to help you come up with the right food pairings for your event. The last thing you want to do is just blindly pair foods and hope they go together. Here are a few tips that will make it easier for you to decide on food pairings for your party. Choose your main dish before you pick anything else. You would be surprised by how many people pick out an appetizer that they really want to serve at a party and then try to build the rest of the menu around that. While appetizers obviously come first and will leave a lasting impression on your party guests, that’s not where you want to begin as far as planning goes. Choose what you’re going to serve as your main dish first and let that dictate the flavor profile for the rest of your party. Balance a heavy main dish out with a lighter appetizer or vice versa. Is the main dish that you’re going to be serving at your party on the heavier side? If so, you should start the night off with some kind of salad or a lighter appetizer. If the main dish is lighter, though, you can feel free to choose something for an appetizer that will be hardy and filling. It’s all about striking the right balance when it comes to food pairings. Avoid picking a lot of dishes that are complicated. 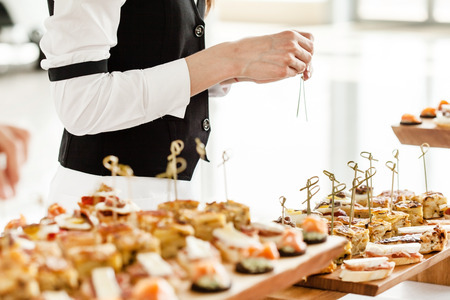 Ideally, your caterer should be able to take care of serving whichever kinds of dishes you want. But for the sake of both your catering company and, more importantly, your guests, you don’t want to make anything you serve too complicated. It could scare people off from certain dishes and ruin the food pairings that you put together. If you’re going to get adventurous with your appetizers, go with simpler main dishes. Or if you want to wow guests with complicated main dishes, make the appetizers easily accessible. People will appreciate it. Coming up with the right food pairings doesn’t have to be complicated. R&R Caterers can help you pair items from our extensive menu for your next party. Call us at 215-638-7376 today to get started.